We have always commemorated May 3, World Press Freedom day. Our convocation for each batch of students at ACJ is held on that day. It is a well attended public event. There is a commemoration address by a renowned academic / thinker / public intellectual on a media-related theme. Among those who have delivered these talks in the previous years are M.S. Swaminathan, Aruna Roy, Robin Jeffrey, Romila Thapar, Irfan Habib, Prabhat Patnaik, Najam Sethi, Binayak Sen, Jayaram Ramesh, P. Sainath, N. Ram, Justice A.P.Shah, Krishna Kumar ( educationist), Raj Kamal Jha, Kumar Shahani ( filmmaker & scholar), C.P.Chandrasekhar ( economist)... I recall from memory and may have left out one or two names. 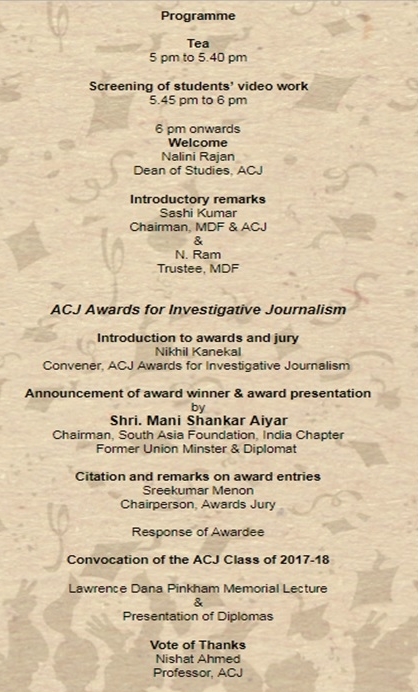 The speaker this year is Mani Shankar Aiyar. In fact we can take pride in the fact that we have commemorated world press freedom day thus each year ever since we started out almost two decades back. We are of course also happy to look at anything else worthwhile that can be done in association with UNESCO. Perhaps one small way to begin this association could be joint publication by UNESCO-Madanjeet Centre for South Asian Journalism & ACJ of all these commemoration lectures as a book. We have them all ( or almost all ) in print as separate booklets which were circulated to the assembled audience and the media on the day of the lectures each year. Each of these lectures is quite brilliant and valuable to journalism students, academia in general and media practitioners internationally for an understanding of issues that dog the media in the south Asian context. We have been planning to publish them as a book ourselves and I am sure finding a good publisher will not be a problem given the nature and scope of these texts. We are in fact now compiling the texts together towards their publication as a compendium. But I just thought this might be something we could do symbolically together with UNESCO as a beginning to possible further and bigger collaborations? I am sorry, I didn’t intend such a long explanatory response to your mail flagging World Press Freedom Day. But as you can see, the day and the cause it enshrines are very close to my, our, hearts and we are especially aware of its significance in these very troubled times for freedom of the press, and speech and expression in general. 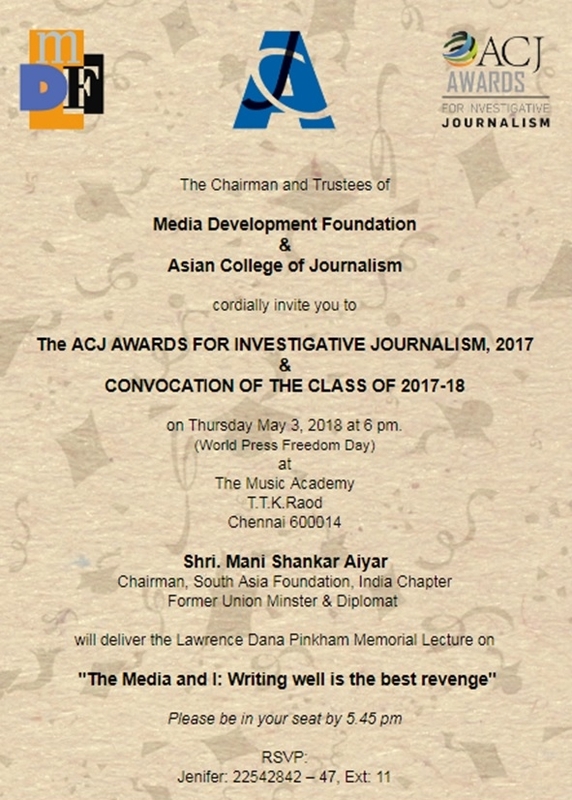 UMCSAJ invites to the function marking the ACJ Award for Investigative Journalism ( 2017) and the Convocation of the Class of 2018 on May 3, which is World Press Freedom Day..